I just posted my first music video! I just started the camera rolling and performed a song with the other half of Park and Ride: Ron Taylor. There's more where this came from. I just found out that I'll be playing at Noe Valley Ministry on December 13, 2003 -- Saturday night! Here's more information about the event. I thought it was time for a little music video to introduce you guys to Ron, and give you a little taste of us live -- so you might come see us play at Noe Valley Ministry in San Francisco when we play December 16, 2003. This song was the last song we wrote together when we were in Seattle in 1999. It's one of my favorites. 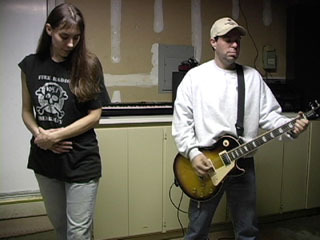 Ron had just re-learned the song when we taped this, so I had to cue him for the chord changes. That's why I keep pointing at him -- that's "the signal" for the chord change.